Anyone who knows me knows that I like things a little different from the norm. I’m a sucker for interesting dials and case shapes, pops of colour, and fresh takes on old designs. That’s not to say that I don’t also appreciate the classics, but I do like some uniqueness. 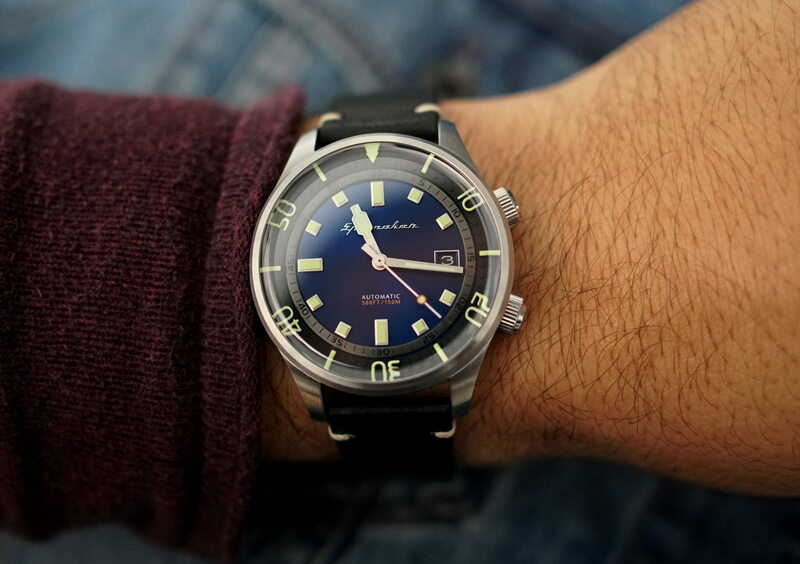 So when I was given the chance to take a look at the latest release from relative newcomers to the watch industry, Spinnaker, I knew they’d have something interesting to offer. A brand that I had seen popping up more and more on my insta-feed lately, Spinnaker’s latest release, the Bradner, takes their trademark design approach, combining interesting details with a vintage inspiration. We’ve got the exclusive first look here, and the Bradner will officially launch and be made available on July 20. 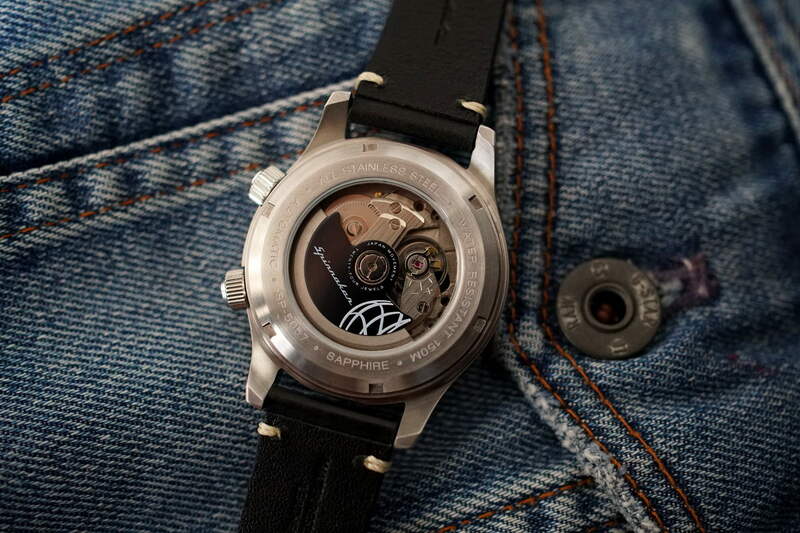 The watch is named after Hugh Bradner, an American physicist who not only worked on the Manhattan Project with Robert Oppenheimer but also developed the first neoprene wetsuit. 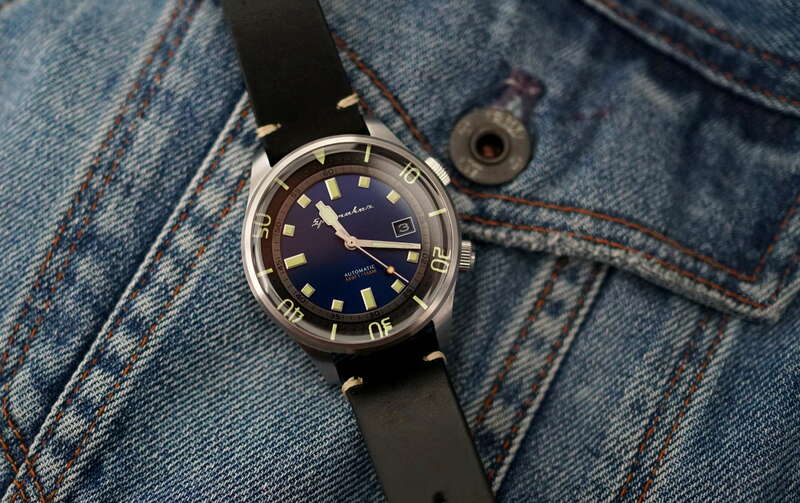 The vintage compression diver styling of the Bradner is made immediately apparent. On the 42mm case’s side is a screw-down crown at 4 o’clock that controls the time setting, while a crown at 2 o’clock adjusts the bi-directional inner bezel. With its minute markers – like the hands and hour markers – coated in a generous amount of Super-LumiNova. 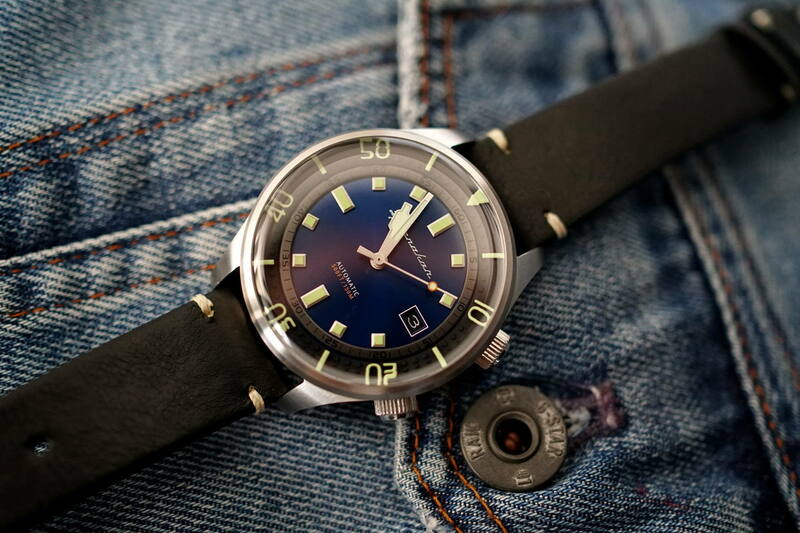 There are several versions being made available – each with different dial colours and straps – and this one features an iridescent blue inner dial and a black leather strap that has been uniquely treated to be water resistant. Speaking of water resistance, the steel case is good for 150 metres and protects the workhorse Seiko NH35 movement inside. The Bradner wears true to its size. It is a little on the thicker side, measuring 14mm from case front to case back; however, the nicely hooked lugs do a great job of holding it to the wrist, and the case sits snug thanks to its large and flat display case back. The dial is nice and legible, and, set against the blue backdrop, the markers and hands appear to be almost always glowing with a green hue. For the price of the Bradner, there’s a lot on offer here. So this is one for anyone who appreciates value, and something a little different when considering a vintage-inspired dive watch. At a quick glance, you would be forgiven for thinking that the inner bezel was actually an acrylic outer bezel sitting on top. The way it combines with the curved edge of the sapphire crystal gives it a three-dimensional depth and slightly distorts the minute markers to capture a distinctly retro look.